Since 2016, Encana has grown its liquids portfolio by 30% annually. Operating netback has also improved YoY since 2016, from $7.52 US$/BOE to $20.36 US$/BOE in 2018. Encana's fair value is $15/share. **Please note that an error was made in the previous submission in the NAV calculation, as the reserves figure was understated. This correction increased the implied valuation from $8.7/share to $15.16/share. Encana (ENA) reduced its workforce 15 per cent and reduced its ranks of executives by 35 per cent in just over a week after closing its deal to buy U.S. rival Newfield Exploration Co. in February 2019. The acquisition has put Calgary-based Encana on track to realize its planned annual savings of $250 million from the acquisition. Employee cost reductions will account for half of the cost reductions, while the other half will come from cutting at least $1 million from the cost of each future unconventional well drilled into the Anadarko basin of Oklahoma, formerly owned by Newfield Exploration (NFX). When announced in November, Encana said the deal was worth about $5.5 billion in shares, but its stock has since fallen by more than 20 per cent since. The company also adopted $2.2 billion of Newfield's debt. Encana has adjusted its exploration priorities in the wake of the Newfield acquisition to focus on three basins - the Anadarko, the Montney of Western Canada, and the Permian of West Texas - as they produce more valuable petroleum liquids and less natural gas than the other prospects. Encana said it will focus 75 per cent of its 2019 capital budget of $2.7 billion to $2.9 billion on those three plays. This acquisition is part of the company's plan to pivot its portfolio towards greater liquids production and bolstering the portfolio of quality low-cost U.S. petroleum assets. 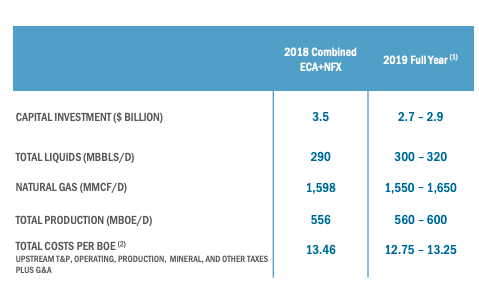 Since 2016, Encana has grown its liquids portfolio by 30% annually (a comparison is shown below between the 2019 reserves report and 2016), and due to the better economics of liquids, it should be able reduce capital expenditures going forward while continuing production growth. 2019 will be the company’s second year in a row generating positive free cash flow - impressive considering competitors like Baytex (BTE) are on the brink of bankruptcy. Encana has achieved greater financial flexibility, allowing the company to deleverage its balance sheet, grow its dividend, and initiate a US$1.25 billion share buyback in 2018, which is more than 10% of the entire market capitalization. Encana reported a 2018 YE profit of US$1.1 billion, or $1.11 per share, compared with $827 million, or 85 cents per share at 2017 YE. Operating earnings for the year amounted to $1.7 billion, up from an operating profit of $1.1 billion a year earlier. Revenue for the year 2018 was $5.9 billion, up from $4.4 billion at 2017 YE. 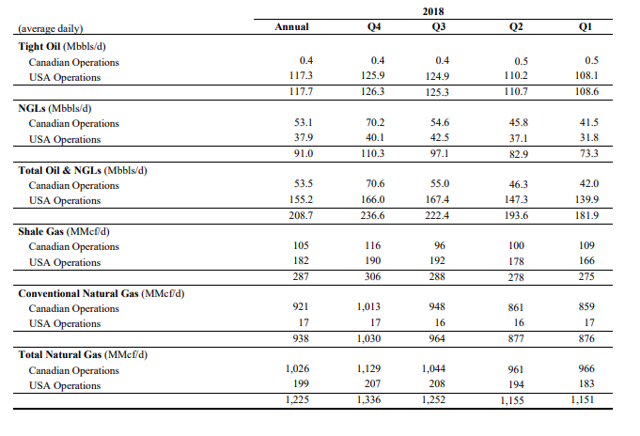 Total production (MBOE/d) in 2018 was 361, up from 313 a year ago, and the company expects to increase total production by at least 55% in 2019, as per the Q1 2019 Corporate Presentation. 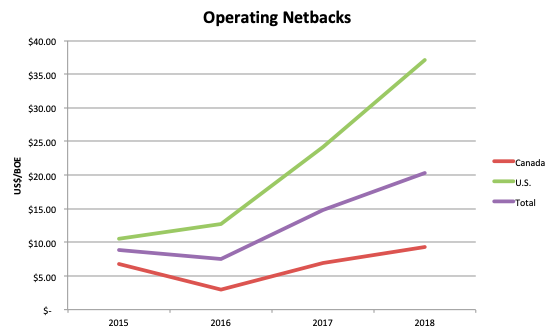 Operating netback has also improved YoY since 2016, from $7.52 US$/BOE to $20.36 US$/BOE in 2018. 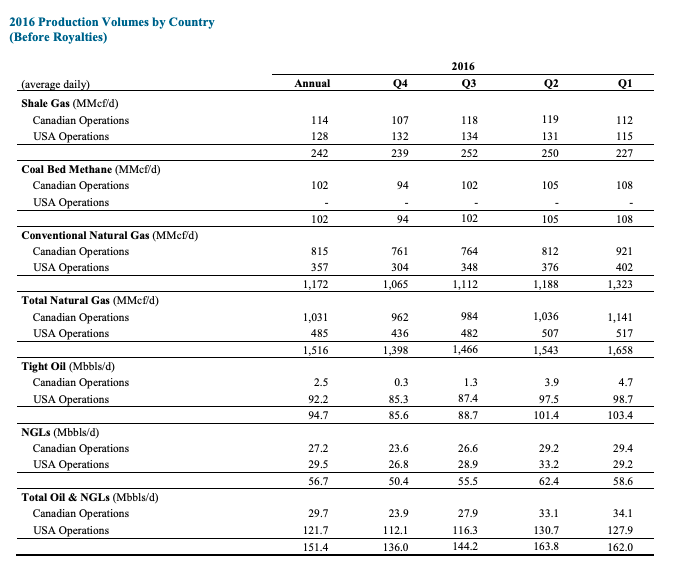 Let's explore Encana's NAV given the recent shifts in their production portfolio. The reserves data set forth below (the "Reserves Data") is from the Form 51-101F1 - Statement of Reserves Data and Other Oil and Gas Information for the year ended December 31, 2018. 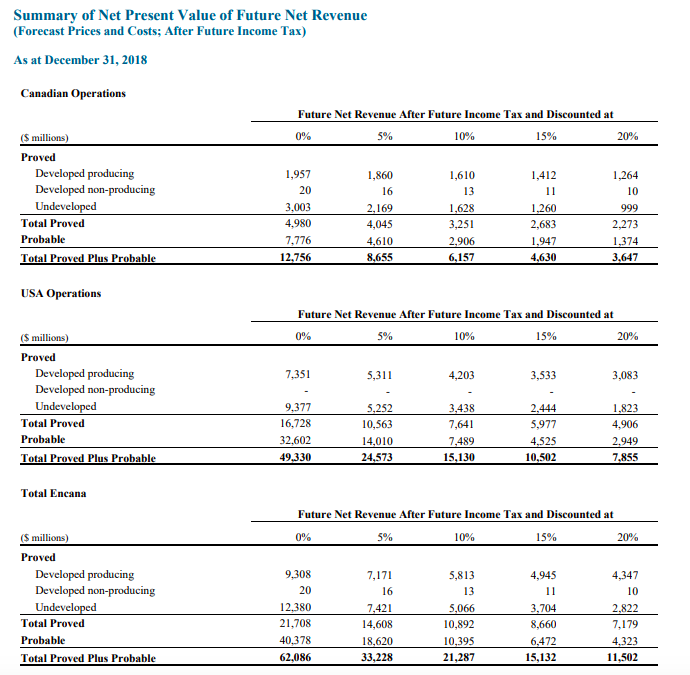 The Reserves Data summarizes the crude oil, natural gas liquids and natural gas reserves of ECA and the net present values of future net revenue for these reserves using forecast prices and costs prior to the provision for interest, debt service charges, general and administrative expenses, the impact of hedging activities, and, after deduction of royalties, operating costs, certain estimated well abandonment and reclamation costs and estimated future capital expenditures. 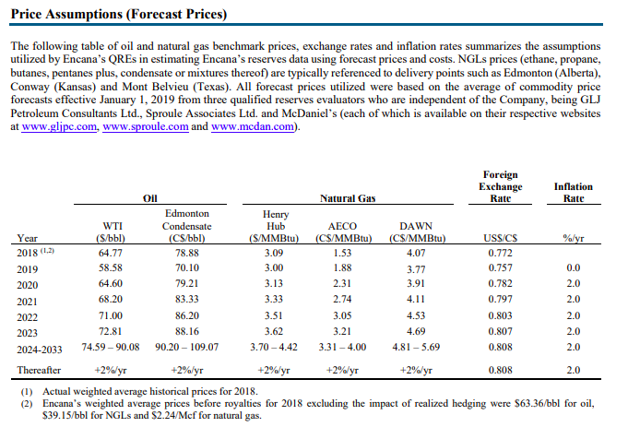 All forecast prices utilized were based on the average of commodity price forecasts effective January 1, 2019 from three qualified reserves evaluators who are independent of the Company, being GLJ Petroleum Consultants Ltd., Sproule Associates Ltd. and McDaniel’s. 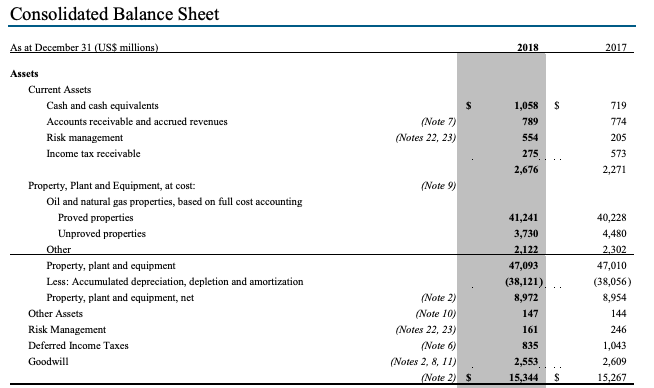 Using a 10% interest rate (as this is the closest to most oil company WACCs), we find that the net present value of the reserves is $15,130 million. Encana has substantially increased its operating netbacks through diversifying its operations into U.S. plays such as the Eagle Ford, Permian, Uinta and Williston (each of which have liquids % > 80). Given the current commodity price outlook, the company appears to be about 50% undervalued from the current market price of ~$10/share. The factors and risks that could challenge the assumptions used herein include increases in royalties payable to the Alberta and federal governments of Canada or regulations that affect major costs such as abandonment or reclamation, political unrest or continued pipeline capacity bottlenecks in Canada. Time horizon is another risk, since as long as investor sentiment persists on these Canadian E & P companies, it may take some time for ECA to realize this upside.